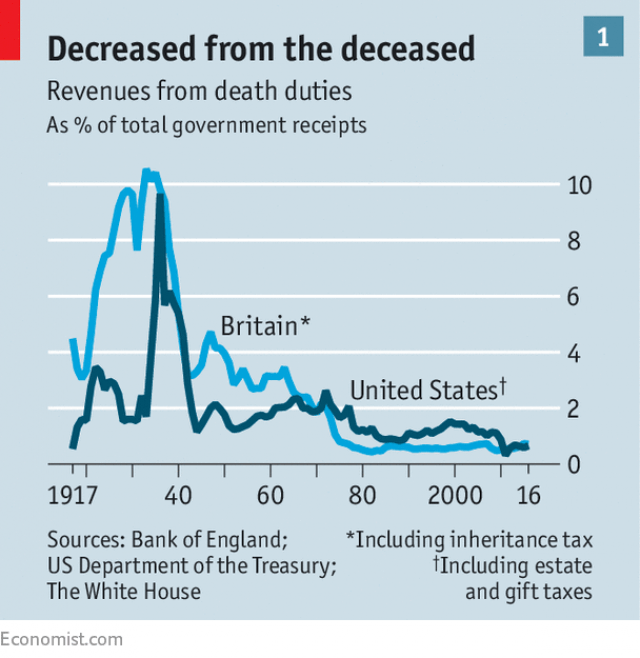 What’s really remarkable, though, is that we’re supposed to believe that death taxes don’t have a negative impact on capital formation (i.e., saving and investment). Utter nonsense. Let’s think this through. Imagine a successful entrepreneur who earns income and gets hit with, say, a 40 percent personal income tax. That entrepreneur than invests some of the after-tax income, which then presumably triggers additional layers of tax (business taxes, capital gains taxes, dividend taxes), which easily can confiscate 30 percent of affected funds. And then there can be a death tax that may grab another 40 percent. What the article overlooks (and what is far more important from an economic perspective) is that the death tax causes capital to be misallocated. Successful families make decisions about saving and investment based on potential tax implications rather than what is most productive. And really successful families create trusts and foundation to protect their wealth. Good for them (and good for their financial advisers), but not so good for everyone else since money won’t be used as efficiently. And if you don’t think the death tax distorts incentives, consider that evidence from Australia indicates it even impacts when people die. P.S. Here’s a semi-amusing left-wing humor on Trump and the death tax. Not as good as the video on Somalia as a libertarian paradise, but still worth sharing. P.P.S. You won’t be surprised to know that both Barack Obama and Hillary Clinton actually wanted to make the death tax more punitive. Which is really remarkable since the current U.S. approach is even more punitive than Greece and Venezuela. One additional point. Mr. Mitchell claims, “I want the tax repealed because it penalizes saving and investment.” This claim overlooks the fact that it is the poor and middle class that need to increase savings. Ninety percent of the population pay 30% of taxes but have only 14.4% of family wealth. Eliminating the wealth tax will continue the downward trend and destroy families. The very rich don’t pay any taxes on most of their economic income during their lifetime. They live on the first 500 million and acquire billions more tax free. Capital appreciation cannot be taxed until the the stock (artwork, real estate, jewels, etc.) is sold on the open market (e.g. the profit must be “realized”). A post-mortem wealth tax is the best way to get the dead freeloaders to pay a fair share – and they don’t feel a thing. To prove the point, I would support a reform of the Estate Tax that limited the tax to wealth that was never taxed during the decedent’s lifetime. The computation of the Estate Tax would allow a full credit for taxes paid to the IRS over a lifetime. What could be more fair? The other is that a permanent, hereditary elite makes a society unhealthy and unfair. Nothing creates a permanent, hereditary elite faster than giving power over capital to the government.